Are you an experienced bodybuilder looking for an edge? Are you in the market for supplements that are going to give you more power and endurance than ever before? 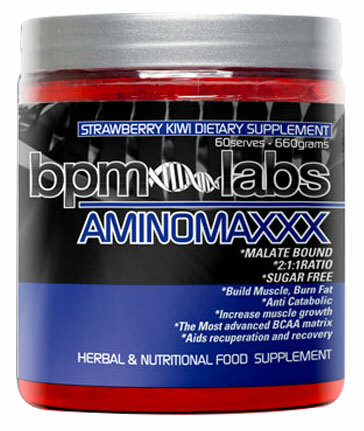 BPM Labs supplements may well be what you're looking for. Scientifically developed, they are targeted at bodybuilders and gym junkies who have plenty of experience behind them. BPM Labs products all about taking your workout to a new level - adding strength, endurance, focus and energy where you never thought you possible. Having joined the sports nutrition supplements market relatively recently, BPM Labs have made a significant mark surprisingly quickly. The reason for this is that their mission has a specific and very potent focus. Rather than attempting to cater to every single person in the fitness business (in other words, weekend warriors, social sportspeople and the like), the company has prioritised the seasoned end of the spectrum. Hence, BPM Labs supplements are powerful products that are high in clinically dosed ingredients and deliver plenty of punch. They're definitely not designed for beginners. The team at BPM Labs knows that real outcomes depend, first and foremost, on ingredients of exceptionally high quality; and secondly, on exhaustive scientific research. They are constantly developing BPM Labs supplements in response to consultation with expert nutritionists, scientists and food technologists; and testing them in the field on seasoned body builders. The focus of BPM Labs research is maximising the impact of key ingredients. They use sophisticated technology, like cutting-edge thermogenics and carefully balanced syntheses of active constituents, in order to create supplements that are as hard-hitting as possible. They also provide premium ingredients in high doses, so that the effects are felt quickly and the results are clear and long-lasting. Two of the most powerful of BPM Labs supplements are the famous LIPODRIVE, which prides itself on being one of the most effective fat burners on the global market; and the inimitable pre-workout powder, THE ONE. BPM Labs LIPODRIVE is driven by thermogenesis, which uses the body's heat-creating capacity to maximise the amount of fat broken down during a workout. At the same time, it provides increased energy and focus, without the crash often caused by standard stimulant-based products. BPM Labs THE ONE contains high doses of potent ingredients, designed to maximise vasodilation, muscle growth, endurance and focus. As you can tell from the name, it's designed to do the whole job in one, single, massive hit!